A few weeks back I was in the refreshingly rainy hamlet of Seattle to rendezvous with my Pinoy peeps and to soak in the city, as it were. And in between brief rays of sun (minutes at best), rain it did; and though we did spend some quality time outdoors, we did oft seek shelter indoors. Besides the wet stuff that falls from the sky, Seattle is different from Denver in other ways. It is, for example, home to many, many Filipino expats and their inevitable extended families. This was equally as refreshing to me as the 4 days of more or less continuous rain showers, because as I have said before, Denver is sorely lacking Filipinos. You may remember from my other posts that Filipinos love the mall, so it should be no surprise that in south Seattle, where the Filipino population is most concentrated, there is a fabulously Filipino mall. I am not one to take much pride or joy in the Filipino mall-loving tradition. Maybe it is because I am but 50 percent Pinoy (I don't care for boxing much either), though whatever the case I was thrilled to go to Seattle's Southcenter mall, and not just because of the pouring rain, but because it has Jollibee. Don't know jollibee? Jollibee is the face in Filipino fast food. 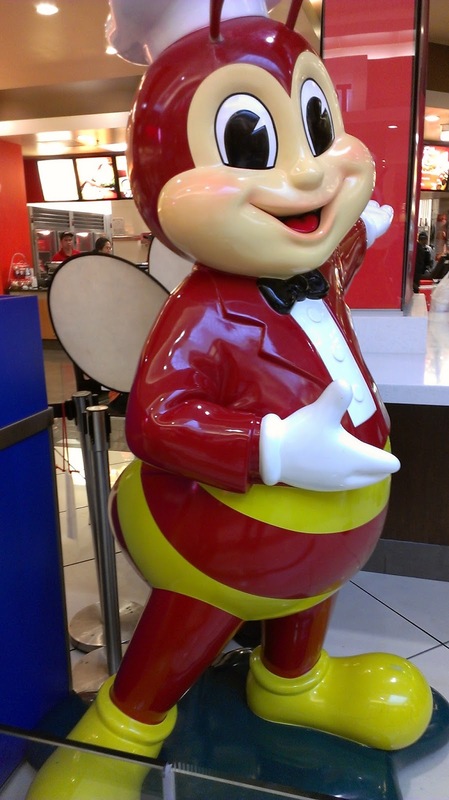 Well, at least the Jollibee jolly bee is. 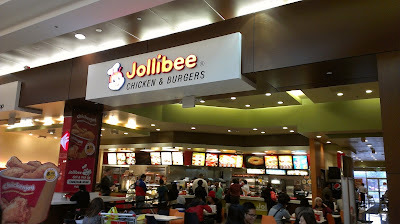 Jollibee is a fantastic (or not-so-fantastic, depending on you taste) mix of fried chicken, burgers and a handful of Filipino-inspired bites like the spam burgers that were recently featured on Bourdain's "new" CNN show. But my family comes here for their love of fried chicken. "Fried chicken?" you may wonder. Yes, although love of fried chicken has been stereotypically associated with other ethnic groups, the Filipino love of crispy, breaded chicken proves how stupid stereotypes really are. That being said, who doesn't love fried chicken? I mean, even if you are a vegetarian, or don't eat the stuff, I doubt it is because you don't like the taste of fried chicken skin and juicy, tender chicken flesh. 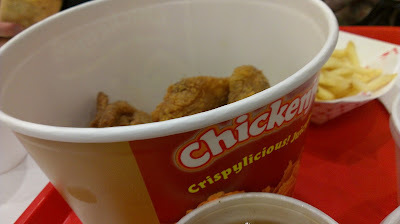 Is there a stereotype for people who don't love fried chicken? The chicken, although "crispylicious", is not entirely unlike other fast food chicken you might come across in the US (save for the side of steamed rice), and it is not as good as in other chicken hubs of the Philippines (like Max's, which I learned is in Vancouver), but it is a taste of home for many and that is likely why we waited almost 10 minutes in line just to order. Was it worth it? Maybe. 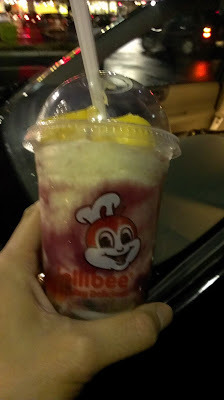 Certainly for the nostalgia and the halo halo, a uniquely Filipino dessert made up of beans, candied fruits, ice cream and many other treats that may or may not sound appealing at first all mixed together--but it is simply fantastic. You can enjoy a very good version of halo-halo at Denver's own Sunburst Grill, but this portable Jollibee version more than did the trick. My wife tore into it before I had a chance to snap a photo, and the photo is shaky as I had to literally wrest it from her hands and then dodge her loving blows as I snapped it. This mall was so full of Filipinos that it also was home to a Filipino evangelical church and a full-on Filipino market that reeks wonderfully of freshly fried fish all day and night. Old Filipino men take over entire sections of the mall to play cards. So next time you are in Seattle and want a fun Filipino experience, head out of the rain and into the Southcenter Filipino Shopping Center.